The Eureka Tavern is located at 10 Park Terrace Salisbury, where they offer good food at great value. Since 2012 the tavern has been known as the House of Schnitzel and it does live up to its name. Offering a choice of beef or chicken schnitzel in three sizes mini, midi or mega. The prices range from $12.50 up to $18.50 depending on the size. There is a choice from thirty different toppings including Aussie (BBQ Sauce, caramelized onion, egg, bacon and cheese) God Father (Neapolitan sauce, bacon, salami, chorizo sausage, baby spinach and cheese) and Yiros (marinated lamb, red onion, tomato, lettuce, cheese and garlic sauce) just to name a few. Other mains include seafood, burgers, pastas, curries and roast of the day. All main meals purchased come with the soup, salad and vegetable bar. For guests in the mood for a large feed, there is another size that isn't featured on the menu, 'The Massive Challenge Schnitzel'. It's not for the faint hearted. 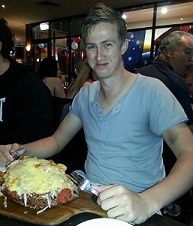 Costing around $30 it features a large schnitzel with choice of topping and a large serve of potato wedges presented on a wooden chopping board. Completing this challenge gets your name on their Hall of Fame board located next to the bar. Enjoy a free garlic bread between two with the purchase of any two schnitzels when presenting the voucher found online. Large indoor playground for kids and Kids Value Meals are available for $7.90 including a meal and a sports cup filled with soft drink or juice. Tuesday nights at Eureka are Curry Schnitzel night where guests can choose from beef or chicken schnitzel topped with one of four curries - previously featuring pork vindaloo, beef rendang, butter chicken and Thai yellow prawn served with a side of chips, a pappadam and raita, an Indian condiment. Turn a nice dinner into a great night out. Hoyts Salisbury Cinema has teamed up with Eureka Tavern to offer movie tickets for $11.90 with the purchase of any main meal. That's dinner and a movie for under $30.